The locations of all outfits and costumes in Pokémon: Let's Go. As you play Pokémon: Let’s Go, you may find yourself wondering where to get all of the game’s Outfit Sets. Not only can you change your outfits and clothing in Pokémon: Let’s Go, you can also change the outfits worn by either Eevee or Pikachu. The first Outfit Set you get in the game is the Sports Set given to you by your sibling in Pallet Town. After that, you’ll need to journey through Kanto and interact with NPCs in order to collect other Outfit Sets. To help make the process easier, we’ve put together a guide on where to get all Outfit Sets in Pokémon: Let’s Go. Below, we'll walk you through where you can get all Outfit Sets in Pokémon: Let's Go. In Pokémon: Let’s Go, you’ll want to talk to every NPC you find in order to get all Outfit Sets. Not only can you get Outfit Sets from NPCs, you can also get valuable items, TMs, and more. As mentioned above, the first Outfit Set is given to you by your sibling before you leave Pallet Town. To equip items from an Outfit Set, you’ll want to press X to open your Menu, then select your Bag. In your Bag, there’s a Clothing Trunk. Open your Clothing Trunk, then choose the items you wish to equip. As you collect more Outfit Sets, you can begin to mix and match items. Additionally, there are accessories for Eevee/Pikachu available for purchase in the Celadon Department Store. If you’re looking for a specific Outfit Set, or want to see if you missed anything, we’ve got you covered. Below, we’ve broken down where to get all Outfit Sets in Pokemon: Let’s Go. The Sports Set is the first Outfit Set you get in Pokémon: Let’s Go. Before you leave Pallet Town, your friend's big sister will be waiting for you. Talk to them, and they’ll give you the Sports Set before you leave. The Sports Outfit Set (as with most Outfit Sets) includes items for both you and Eevee/Pikachu. 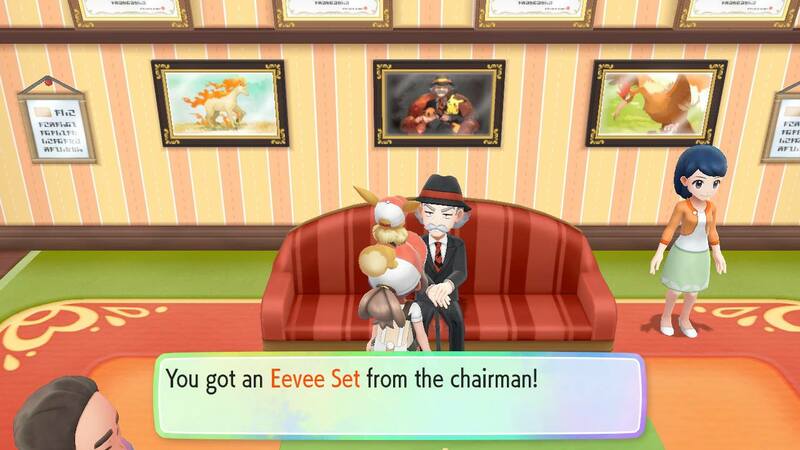 In Pokémon: Let's Go, you get the Eevee Set from the Chairman at the Pokémon Fan Club in Vermillion City. 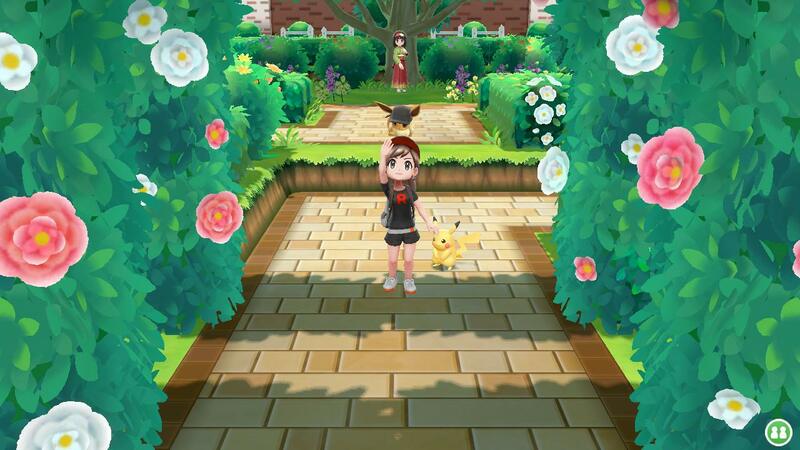 Once you reach Vermillion City in Pokemon: Let’s Go, you’ll want to head to the brightly decorated building that houses the Pokémon Fan Club. Near the couch, you’ll find the Chairman. Speak with the Chairman and say “Yes” when he asks if you want to hear more about Pokémon. He’ll ramble about the ones he finds the cutest, and when he’s finished, he’ll apologize for rambling and give you the Pikachu or Eevee Set (depending on which version of the game you own). After you reach a max bond with your Pikachu or Eevee, return to the Chairman of the Pokémon Fan Club to get either the Raichu or Eeveelutions Outfit Set in Pokémon: Let's Go. The Eeveelutions Outfit Set includes apparel based around Vaporeon, Jolteon, Flareon, Espeon, Umbreon, Leafeon, Glaceon, and Sylveon in Pokémon: Let's Go. Other ways to increase your bond include tossing money in the Fountain in Celadon, and letting Eevee check out the view from the top of the S.S. Anne. After you reach a max bond level, return to the Pokémon Fan Club in Vermillion City. Again, speak with the Chairman and he’ll praise your bond with Pikachu/Eevee. As a reward, you’ll be given the Raichu or Eeveelutions Set in Pokémon: Let’s Go. 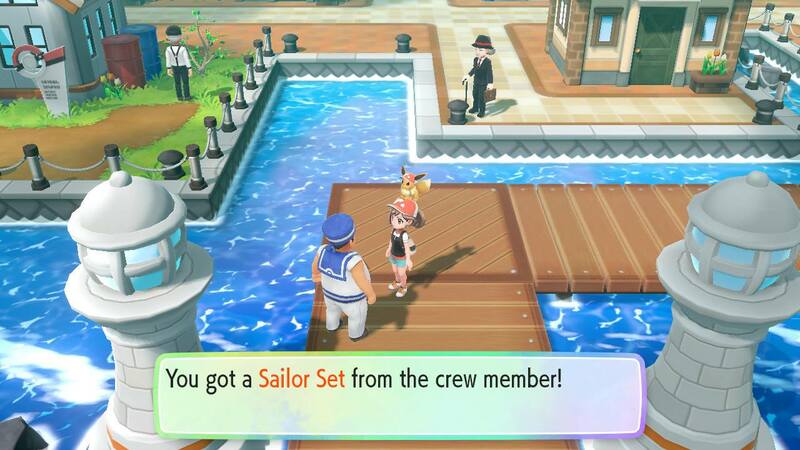 In Pokémon: Let's Go, you get the Sailor Set from the friendly sailor outside the S.S. Anne in Vermillion City. Similar to the Sports Set in Pokémon: Let’s Go, the Sailor Set is tied to the game’s story and is an Outfit Set you can’t miss. After you’re given tickets to the S.S. Anne by Bill, you can head to the port in Vermillion and board the ship. Before you board, you’ll speak with a friendly sailor who gives you the Sailor Set in Pokémon: Let’s Go. 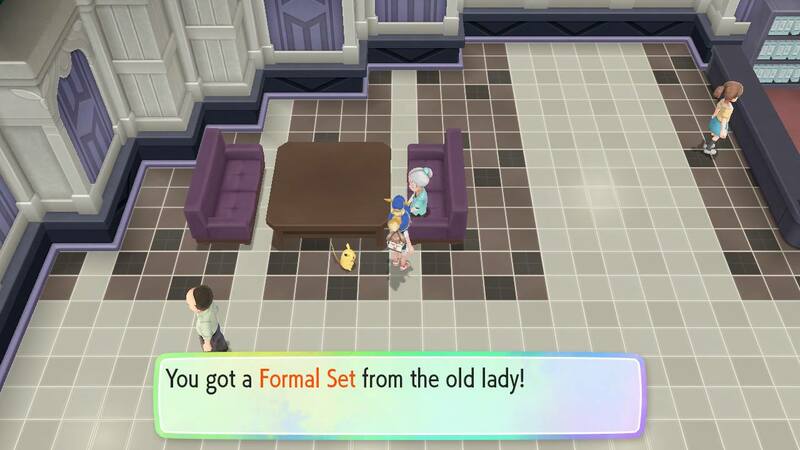 In Pokémon: Let's Go, you get the Formal Set from a friendly old lady on the bottom flooLavenderendar Tower in Lavender Town. In Lavender Town, you’ll spend quite a bit of time exploring the Tower. Rather than climbing Lavender Tower clad in a Sailor Outfit, you can pick up a Formal Outfit Set on the ground floor. To get it, head over to the set of purple sofas and speak with the old woman sitting there. She’ll ask you if you’ve come to pay your respects, then will give you the Formal Outfit Set in Pokémon: Let’s Go. 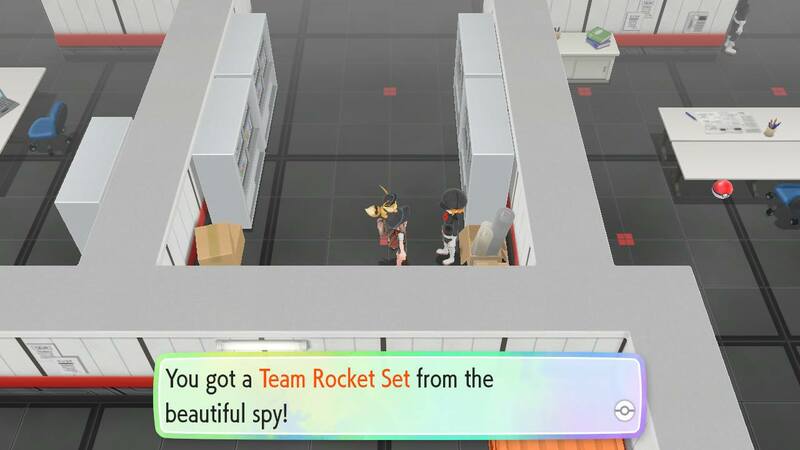 In Pokémon: Let's Go, you get the Team Rocket Set from a "beautiful spy" in the Team Rocket hideout below the Rocket Game Corner in Celadon. If you want to channel your inner Team Rocket, you can pick up the Team Rocket Outfit Set in Pokémon: Let’s Go. To get it, you’ll want to climb Lavender Tower until you encounter Cubone. After Cubone leaves, you can follow him out of Lavender Tower towards the West edge of town. There, Team Rocket will capture Cubone and take him to a secret hideout in Celadon. To find him, head to the Rocket Game Corner in Celadon, then interact with a poster to the right of the Cashier. Under the poster is a switch that opens a stairwell to the basement. Head to the basement and explore. Eventually, you’ll encounter a member of Team Rocket in a long corridor staring at a wall. Speak with her, and she’ll give you the Team Rocket Outfit Set in Pokémon: Let’s Go. In Pokémon: Let's Go, you get the Policet Set from Officer Jenny after defeating Team Rocket at Silph Co in Saffron City. Another Outfit Set that’s tied to the Team Rocket storyline in Pokémon: Let’s Go is the Police Set. To get the Police Outfit Set, you’ll need to journey to Saffron and enter the Silph Co. building. After you defeat Team Rocket again, head out of the Silph Co. building and travel to the Northern edge of Saffron. There, you’ll find Officer Jenny. 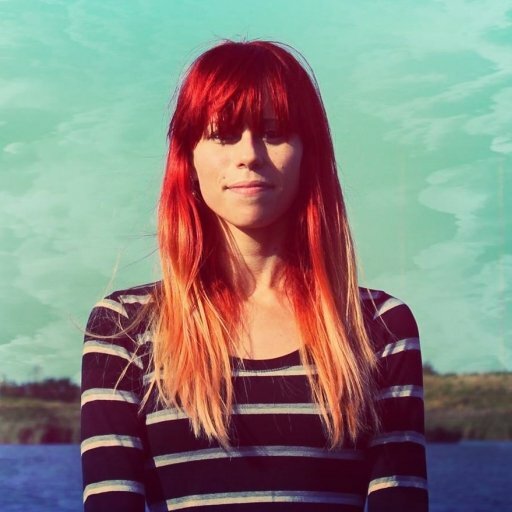 Interact with her, and she’ll praise your heroic efforts. 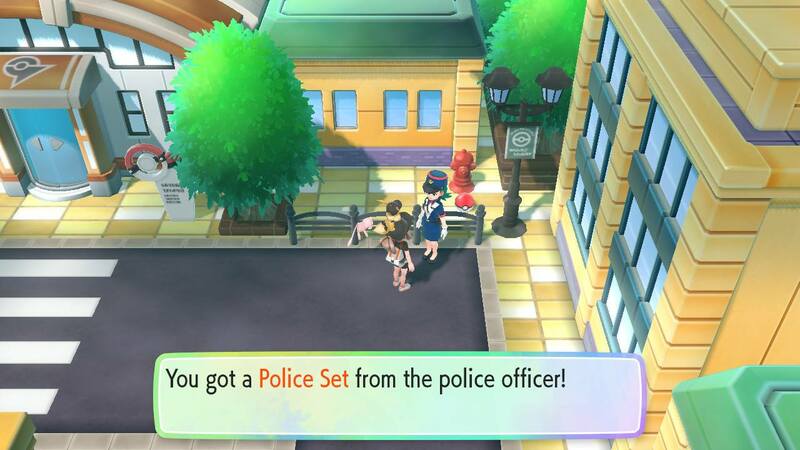 As a reward, you’re given the Police Outfit Set in Pokémon: Let’s Go. 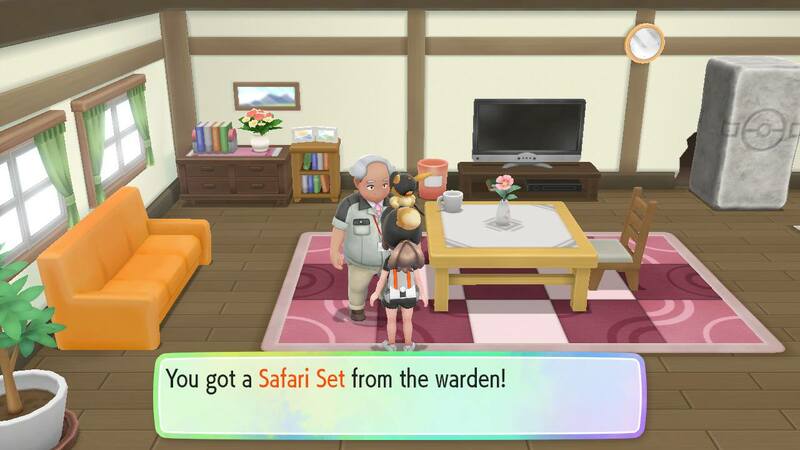 In Pokémon: Let's Go, you get the Safari Set after giving the Warden back his Gold Teeth. To get the Safari Outfit Set in Pokémon: Let’s Go, you’ll need to make your way over to Fuchsia City. On the Southern edge of town, you’ll find the home of the Warden of Safari Zone. After interacting with him, he’ll inform you that he lost his set of Gold Teeth around the Route 19 area. Head to Route 19, and you’ll pick up the Warden’s Gold Teeth after encountering Team Rocket once again. Return to the Warden’s House and give him his Gold Teeth. As a reward, he’ll give you the Safari Outfit Set in Pokémon: Let’s Go. 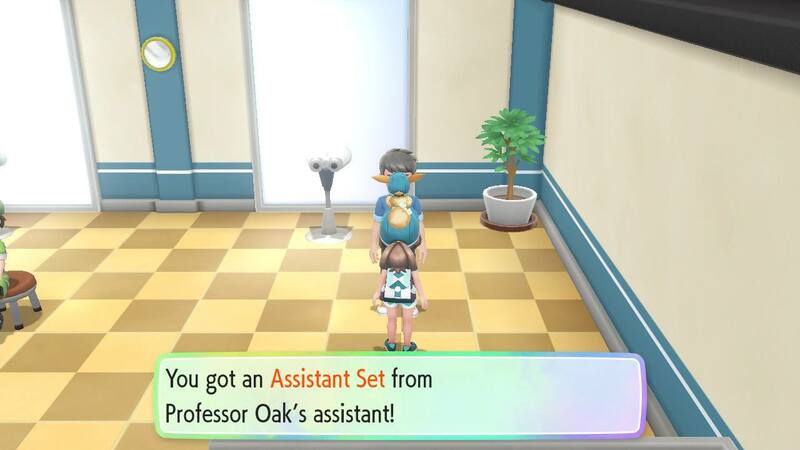 On the upper level of the Route 15 gate, you can get the Assistant Outfit Set from Professor Oak's Assistant as long as you've caught 50 or more different Pokémon in Pokémon: Let’s Go. To pick up the Assistant Outfit Set in Pokémon: Let’s Go, you’ll need to make your way over to the Route 15 gate into Fuchsia City. Head towards the bottom of the screen, and on your right will be a set of stairs. Take these stairs and speak with the Lab Assistant. He'll ask you if you've collected at least 50 different Pokémon in your PokéDex. If you meet this requirement, he'll give you the Assistant Outfit Set in Pokémon: Let’s Go. One tip to get the required amount of Pokémon in your PokéDex is to use the GO Park Complex in Fuchsia City. By connecting your Pokémon GO account, you can bring Pokémon over and catch them in the GO Park and in doing so, expand your PokéDex! At the end of Pokémon: Let’s Go, you have the opportunity to get the Team Rocket Blast Off Outfit Set. To get the Team Rocket Blast Off Set, you’ll first need to acquire all 8 Gym Badges in Pokémon: Let’s Go. After that, head to Victory Road (on the way to the Elite Four) and seek out Team Rocket's notorious Jess and James. Challenge them to a battle, and after you defeat them, you'll unlock the Team Rocket Blast Off Set in Pokémon: Let’s Go! What Can You Buy in the Celadon Department Store? You can purchase a ton of accessories for Pikachu or Eevee by visiting Floor 5 of the Celadon Department Store in Pokémon: Let's Go. In addition to Outfit Sets, you can purchase accessories for Eevee or Pikachu on Floor 5 of the Celadon Department Store. Once you reach Floor 5, you’ll see a variety of tables set up. Speak with the lady at each table, and you’ll be able to view different accessory options including Bows, Bandannas, and Glasses, among other options. Right now, the most expensive item for sale is a Crown at 999,999. 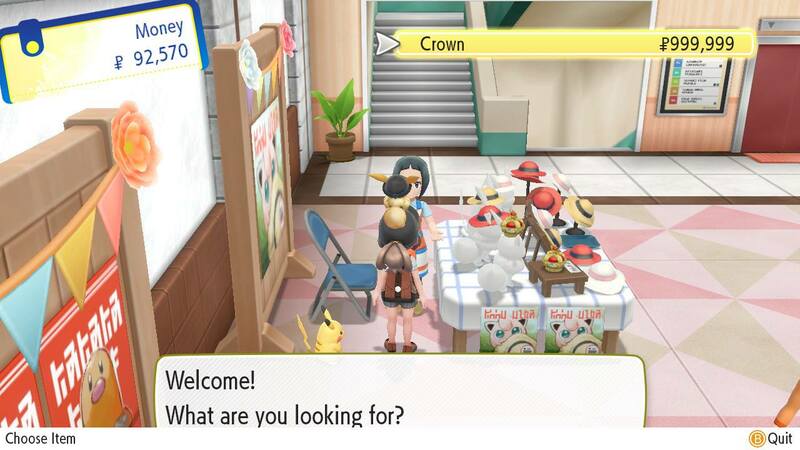 As expected, the Crown will likely be the last cosmetic item you pick up in Pokémon: Let’s Go. Until you accrue the necessary Coin, you can purchase cheaper accessories like the Diglett Cap for 50 Coins. Below, we’ve listed all of the accessories available for purchase in order of cheapest to most expensive! 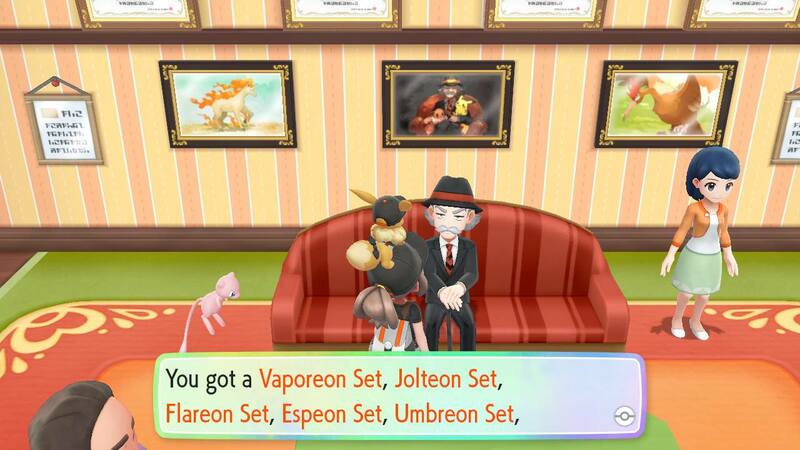 Were you able to grab all of the Outfit Sets in Pokémon: Let’s Go? If so, which one is your favorite? Let us know down in the comments below! For more on Pokémon: Let’s Go, be sure to check out some of our previous guides including the difference between the Eevee and Pikachu versions of Pokémon: Let’s Go, all Berry types in Pokémon: Let’s Go, and how to get Mythical Mew in Pokémon: Let’s Go. By reading through this guide, you should now know where to get all Outfit Sets in Pokémon: Let’s Go.